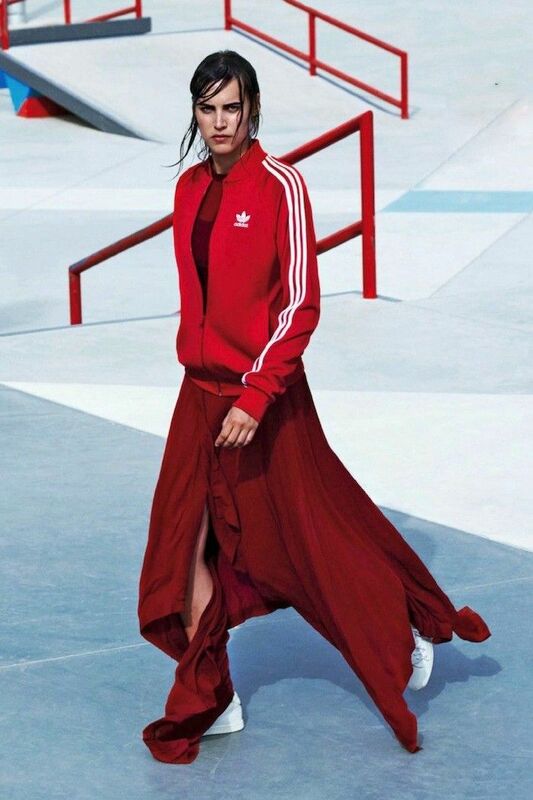 There's nothing new about Adidas dominating the athleisure trend, especially with its Superstar sneakers, but now fashion girls are clamoring to get their hands on the brand's old-school tracksuits as well. It's no surprise either, since the jacket and pants set has a '90s feel that the industry has been nostalgic for lately. Not only are we seeing these worn as separates with the expected white tee, leggings, or jeans, we've also been spotting them with more elevated sweaters, pants, and dresses for fall in a number of high-fashion spreads, one of which recently appeared in Marie Claire Spain. For this fashion-forward take, try sticking with a monochromatic palette as seen here, making sure to keep your head-to-toe look in the same color family. Keep scrolling to see the Marie Claire Spain spread, plus how to get your hands on one of these cool sporty pieces. Bring your sporty looks up a notch with this bright red jacket. You can't get more classic than this black track jacket. These track pants are great for dressing down with sneakers or elevating with sleek pumps. How would you style a tracksuit with an elevated feel? Tell us in the comments below!